"The left hand is thought to show the qualities you come to this earth with and the right hand shows the potential that you can fulfil with your free will." Click on image to visit museum link. She was tried for witchcraft in Salisbury, MA; convicted, but not executed. The papers pertaining to the case show the high estimation in which she was held. Think there are no women accused of witchcraft in modern times? Think again. Helen was a simple woman supporting her disabled husband and her 6 children by working full time in a bleach factory and part time as a Spiritualist Medium. Her messages during the Second World War became so accurate that she was arrested and tried as a 'witch' for fear she would reveal the truth about D-Day plans, the Enigma Machine and much more. As "Goodwife Garlick", Elizabeth was accused of bewitching a woman and causing the death of her child while residing in East Hampton, Long Island. She was, fortunately, acquitted. Not all "witches" were from Salem, MA. Many were accused and executed in Connecticut and both Rebecca and her husband, Nathaniel Greensmith were hanged in Hartford in 1662. One of the women accused and hanged at Salem's famous witch trials. Some of the testimony against Elizabeth is found here. Sixteen-year-old Elizabeth was a servant in the house of Rev. Samuel Willard when she became "possessed" in 1671. Rev. Willard left a detailed account of the case. Accused of witchcraft, Susanna was one of the twenty women and men executed during the hysteria that gripped Salem, MA in 1692. Rebecca, probably the most famous of the Salem "witches", was one of three sisters accused and imprisoned for withcraft. One of her sisters, Sarah survived. Rebecca and her sister Mary were hanged. Long before Salem, there were the "Pendle Witches" of Lancashire, England. Alice was one of the seven "witches" executed August 20, 1612. Her crime was bewitching a man to death. A Springfield, Massachusetts woman and wife of a prominent citizen, Mary went to court twice - once as the plaintiff against a woman who had accused her of witchcraft, and secondly as a defendant when she was again accused of witchcraft. Her daughter, Ann Jr. started the Salem witchcraft hysteria. Ann Putnam Jr.'s testimony is here. In 1664 in the town of Lindheim, Germany, Martha Schuler was arrested, imprisoned, tortured and eventually burned for witchcraft. Her husband, arrested with her, was able to escape. Having a magistrate for a husband did not prevent Sarah from being tried, convicted and executed as one of the Salem witches. One of the women in Andover, MA who was victimized by the Salem witch hysteria, Sarah and her daughter, Sarah, Jr. were both arrested, imprisoned and forced to "confess" to witchcraft. Images of Anne Golon's original manuscript and translation - snippets only - sorry! Part 1 - Chapter 1 in English! Angélique - La Route de L'Espoir is Book 12 in the series and one of the three books not yet available in English. The title is proving to be tricky to translate into the English language and is usually accepted as 'Pathway' or 'Path to Hope' either of which is, to say the least, more than a little clumsy. However, this book title does translate well into several other languages (see sidebar) which makes it doubly irritating and frustrating for those of us still waiting to find out if this book will ever see the light of day in the English language. Even if it does, will the (literal) translation be used? To me it would not, for a punchy and attractive title make! Would you be tempted to buy a book whose title stated 'Pathway to Hope'? Try as I might, there is nothing really that makes me want to jump with joy in relation to any possible translation of this title - according to the dictionaries 'expectation' could be intermingled with the meaning of hope but I still cannot see it as satisfactory! 'Angélique expectant'? Talking of Anne's use of the written word I am reminded of a conversation I had with her daughter very early on in our friendship when she first brought to my attention how her mother's work had been edited. Whereas Anne had allowed Angélique a full page to marvel at what she was seeing and feeling in this new and untouched world, the editors condensed it into one sentence remarking that the sky Angélique was looking at was painted in all the shades of dawn colours! 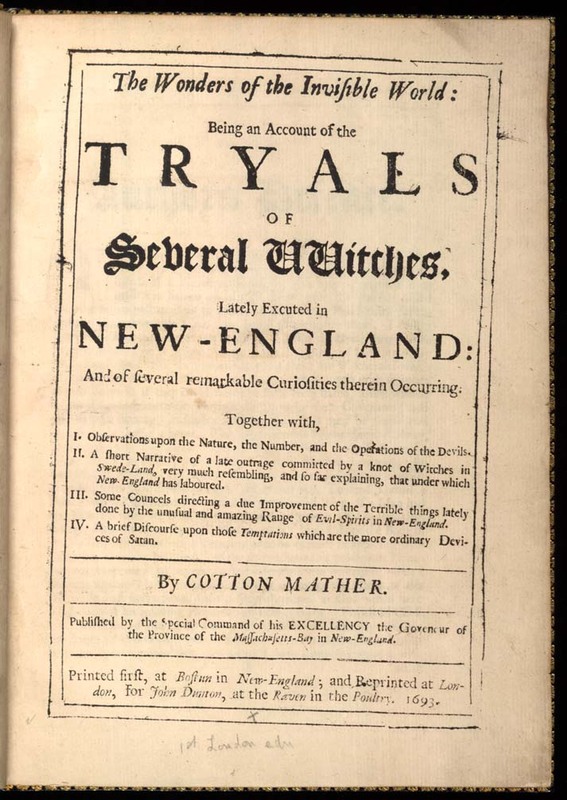 Part 1 of the book is called 'Miracle in Salem' and places the action in New England in the middle of the fermenting 'witch hunts' and trials which highlight the prejudices of that very old world which many sought to escape. It's an interesting concept, by the author, to place two such prominent members of the French Court (profoundly Catholic of course) as the Count and Countess Peyrac into this maelstrom. And, it is reasonable to expect that they should be viewed with suspicion, if not with downright hostility and shunned outright by the English Protestant community. However, we know from previous books that Anne Golon never shies away from a challenge. And needless to say, Angélique and Joffrey are very much in the forefront of the action - the opening scene has Angélique sitting in judgement of a young man and, as she has (apparently) learned to speak English, is conducting the proceedings! Talking of challenges, as usual Anne Golon makes us get our calculators out to try and work out the ages of Angélique and Joffrey in this book - I think in general terms most of her readers are happy to accept that Angélique herself is probably 39 or 40 and still, realistically of child-bearing age. And ... you may remember a certain prophesy in one of the earliest books, Road to Versailles, in which Angélique is told she will bear*** six children. “Don’t bother,” protested Angélique, trying to draw away her hand. In the carriage that was taking them back, Athénaïs raged. Poor petulant Athénaïs, could she even dream that her illegitimate son would one day become the Count of Toulouse - I can't wait to find out how that real historical fact works out in Book 14! Back, therefore to the question of six children and Angélique's child-bearing capabilities. We know she's as healthy as a horse and there was no evidence, offered by the author, of any close in-breeding in the de Sancé or de Peyrac families. Florimond is hale and hearty and born into privilege, Cantor is sturdy and hearty despite his impoverished entry into this world. The deeply mourned Charles-Henri, child of closely related cousins, appeared not to have inherited any infirmities and his death was not attributable to any in-breeding worries. (***Angélique carried an interim child by Colin Paturel, but miscarried before coming to full term.) Honorine stemmed from an alternative gene pool and apart from inheriting a triple dose of mischief and an undeniably high curiosity and IQ level is a healthy child with healthy appetites. She even survives the cruellest of hands dealt to her by fate in the most difficult of conditions as described in Book 13. Two of the major strands then, of this book and the long forgotten memory described above (the Salem trials and the art of palmistry) that I intend to concentrate on are both in part one which translates easily enough into 'Miracle at Salem'. This page will deal with what was happening in Salem at the time and how events still impact in the 21st century - such as, the Salem Police Department wear their Witch City badges with pride. L to R The Original Salem Police Badge and the new modern one with which it has been replaced. Using the new format police badge the divisions are identified as the pedal bicycle unit, the police diving team and the motor-bike unit. My thanks to Lady of Spiders who has already created her own web-page dealing thoroughly with the subject of witch torture from the middle ages via the Inquisition and beyond and for anyone having a morbid fascination please follow the links. I am grateful to her for concentrating in part on the impact on the inhabitants of Salem who are notorious rather than famous for their witch trials but who can make a decent living, now from those unenlightened times. Our personal visit to New England and Salem will, in time, be included in and recounted on the Anne Golon page. And so back to the inhabitants of this turbulent time, who believed they had escaped the horrors of Europe steeped in the fanatical pursuit of poisoners and sorcerers and those not adhering to the old religion. Witch-hunting, after a major outbreak in France, had begun to decrease. In 1643-1645, the largest witch-hunt in French history occurred resulting in an exodus to the new world. During those two years there were at least 650 arrests in Languedoc alone. The same time-frame was also one of intense witch-hunting in England, as the English civil war created an atmosphere of unrest that fuelled the hunting, especially under Matthew Hopkins. However, the number of trials began to drop sharply, in the late 1640s. By 1648 Holland had become a tolerant society that had done away with punishments for witchcraft. Wholesale slaughter of 'witches' at the height of the persecution years. Not however for the settlers in the New World who now, in the late 1600s, face, once more the witch hunt - prevalent everywhere but not more so than in Salem. Salem also introduced its own particular form of torture that of the 'Stacking Stones' re-enacted for visitors to Salem at the city's museum. This method was most commonly used during the Salem witch trials in order to extract a confession. The accused (male or female) would be forced to the ground and lain prone. A flat stone slab would then be placed on their sternum. Questioning would start and the more the victim protested their innocence and denied their affiliation with the devil and sorcery, the more rocks were gradually placed onto the slab. Needless to say many died, crushed to death, others capitulated only to find themselves executed in some other manner or ostracised and banished from their community, tainted forever with the stigma of witchcraft. Dr. William Griggs examines Betty Parris and declares her possessed by the Devil. To understand the events of the Salem witch trials, it is necessary to examine the times in which accusations of witchcraft occurred. There were the ordinary stresses of 17th-century life in Massachusetts Bay Colony. A strong belief in the devil, factions among Salem Village fanatics and rivalry with nearby Salem Town, a recent small pox epidemic and the threat of attack by warring tribes created a fertile ground for fear and suspicion. Soon prisons were filled with more than 150 men and women from towns surrounding Salem. Their names had been "cried out" by tormented young girls as the cause of their pain. All would await trial for a crime punishable by death in 17th-century New England, the practice of witchcraft. As years passed, apologies were offered, and restitution was made to the victims' families. Historians and sociologists have examined this most complex episode in our history so that we may understand the issues of that time and apply our understanding to our own society. The parallels between the Salem witch trials and more modern examples of "witch hunting" like the McCarthy hearings of the 1950's, are remarkable. "We whose names are underwritten, being in the year 1692 called to serve as jurors in court at Salem, on trial of many who were by some suspected guilty of doing acts of witchcraft upon the bodies of sundry persons, we confess that we ourselves were not capable to understand, nor able to withstand, the mysterious delusions of the powers of darkness and Prince of the air, but were, for want of knowledge in ourselves and better information from others, prevailed with to take with such evidence against the accused, as, on further consideration and better information, we justly fear was insufficient for the touching the lives of any (Deut. xvii) whereby we fear we have been instrumental, with others, though ignorantly and unwittingly, to bring upon ourselves and this people of the Lord the guilt of innocent blood; which sin the Lord saith in Scripture he would not pardon (2 Kings xxiv.4) - that is, we suppose, in regard to his temporal judgments. We do therefore hereby signify to all in general, and to the surviving sufferers in special, our deep sense of, and sorrow for, our errors in acting on such evidence to the condemning of any person; and do hereby declare, that we justly fear that we were sadly deluded and mistaken - for which we are much disquieted and distressed in our minds, and do therefore humbly beg forgiveness, first of God, for Christ's sake, for this our error, and pray that God would impute the guilt of it to ourselves nor others, and we also pray that we may be considered candidly and aright by the living sufferers, as being then under a strong and general delusion, utterly unacquainted with, and not experienced in, matters of that nature. We do hereby ask forgiveness of you all, whom we have justly offended, and do declare, according to our present minds, we would none of us do such things again, on such grounds, for the whole world - praying you to accept of this in way of satisfaction for our offense, and that you would bless the inheritance of the Lord, that he may be entreated for the land." William Fisk - the Accuser is himself accused! Thomas Pearly, Sr. | John Peabody | Thomas Perkins | Samuel Sayer | Andrew Eliot | Henry Herrick, Sr. Right at the top of this page I told you that this was one of the, as yet, untranslated books which has long been awaited by many of Anne's fans. Sadly, some have even left their mortal coils without reading the translations, our founder President Harvey J Adkins was one. Thanks to him, many of us finally found a source of information concerning Anne Golon's Angélique. It also led to many of us meeting each other and sharing a number of experiences - some good, some bad. Some of us were lucky and privileged enough to meet Anne Golon through the good auspices of Harvey, whom we voted in as the first President of the 'Friends of Angélique' - it could hardly have been any different as Harvey was, to all intents and purposes, also the founder member of the group. Harvey used the internet to reach out and we caught hold and held on tight - from that came an official web-site sanctioned by Anne Golon - currently the original 'World of Angélique' is not available but I have recreated as much of the site as I could here. Because I have met Anne and earned her trust, I am enjoying sharing all the knowledge I have in the creation of this part of my personal web-site - no other author will merit quite such a comprehensive insight into their work. Other sections of the web-site will feature my diverse passions - Angélique was and continues to be a passion and was a 'quest'. Because of the trust that I earned, as did my sister - Anne Golon entrusted to us a copy of her manuscript of Route de L'Espoir and my sister is working on the translation. Like Anne Golon, my sister writes up her work (by hand) - I, am lucky enough to get to type it up! However, in my own defence, I did read the book first in French and then in Polish, so am not completely dependent on the English translation. The images on the side bar are genuine scans of the original hand-corrected manuscript that had already been typed up by Anne's daughter Nadine and the final two images are a page of hand-written translation and my typing 'skills'. I hope you have enjoyed this page - although Route de L'Espoir is not my favourite of the three as yet untranslated works, it is, in fact, the one I know best!